COWBOYS coach Paul Green has challenged his troops to aim up against the Eels and save the club's greatest player, Johnathan Thurston, from the pain of a wooden-spoon finale. 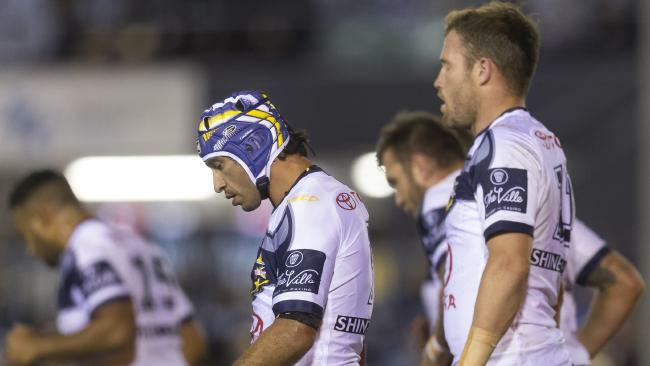 Retiring champion Thurston plays his final home game in Townsville this Friday night, but rather than a pure celebration, the Cowboys are under pressure to avoid crushing humiliation. North Queensland and Parramatta are equal last on 14 competition points, with the Eels' differential (-104) slightly superior to that of the Cowboys (-114). Parramatta face a daunting final-round clash against big guns the Roosters in a fortnight, meaning the Cowboys will almost certainly avoid the dreaded spoon if they dispose of the Eels. Thurston has literally spilt blood for the club - he sustained a small facial gash in a 28-16 loss to Cronulla on Saturday night - and Green says the club owes their 2015 premiership hero a fitting send-off. It will be Thurston’s final home game. Photo by Mark Evans/Getty Images. "It's important we give 'JT' the honour he deserves given what he has done in the game," Green said. "There's a couple of big weeks coming up, given where we are at. "If we (fast) forward a week and we're sitting there after the (Eels) game, and we haven't got the result we want, it won't feel very good. "The emotion (of Thurston's final home game) is going to be there. From a team point of view, it's important we make sure we prepare well this week and get the outcome we want." Underlining the Cowboys and Eels' fall from grace, Thurston will line up against Parramatta ace Jarryd Hayne. Four years ago, the pair shared the code's premier gong, the Dally M Medal, as the most dominant players in the NRL. Now, they are playing off for the wooden spoon. Thurston plays his 293rd game for the Cowboys this week and is primed for one more magic act in front of his adoring fans. "It's extremely important (to avoid finishing last)," Thurston said. "We have one fight on our hands. "The boys have to make sure we turn up with the right intent and give ourselves the best preparation we can heading into Friday night. "It's a short turnaround from this (Cronulla) game and hopefully we get troops back (Jason Taumalolo and Matt Scott) and move forward." 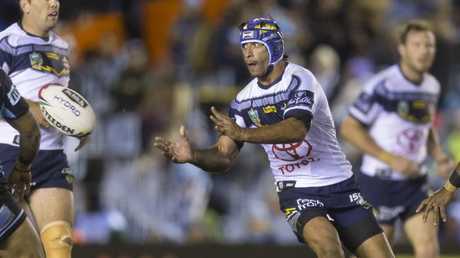 Fullback Te Maire Martin said Cowboys players would be bitterly disappointed if they allowed Thurston to suffer the ultimate humiliation for an NRL player. "JT doesn't deserve the wooden spoon," he said. "The truth is if we produce the second half that we did (against Cronulla), we'll be going close to getting the spoon. "None of the boys want that for ourselves or JT, so we have to really aim up in defence this week and deliver a lot more effort."